With the advent of trenching machines nearly seventy years ago, Ditch Witch the inventors, revolutionized the industry and put paid to manual trenching throughout most of the world. Yet in South Africa the chain gang still prevails with manual labour used to painstakingly dig our trenches and foundations, almost as if it were some kind of job creation strategy. Unfortunately, the truth is that manual trenching is not a form of job creation at all; and if anything, it cripples the base of construction and infrastructure delivery to the extent that it prevents workers from obtaining more meaningful and sustainable employment. Take a look at the affordable housing market where a backlog of nearly half a million houses dogs the industry on a monthly basis. So, what do well-meaning contractors who are trying to fill the gap do? Well they throw more men at it in the hope that 10 men can dig a foundation in a day and help them start catching up the backlog. 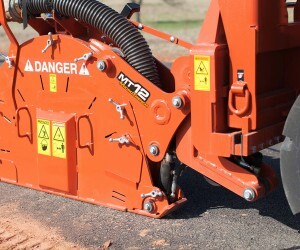 But, this is futile: a small ride-on Ditch Witch RT45 trencher can dig up to 25 or even 30 foundations a day. Redeploy the ten labourers per house and with a bit of training they could be increasing housing outputs 20-fold or more. Keith Smith, area sales manager of ELB Equipment, local distributors of Ditch Witch, says speed is just one reason to use a trencher, but there are many, even more compelling, reasons to add a Ditch Witch to the construction fleet. “It also digs trenches and foundations to exact dimensions. This is important in terms of quality of trenches or foundation to avoid failures where they are too shallow or too thin as is often the case building sites. “In terms of concrete usage alone, the savings in concrete will more than cover the cost of the machine when offset against money savings from accurate estimation and usage of concrete. If a chain gang were to dig a foundation just 100mm deeper or wider than the specification then the entire calculation would be out and the foundation may need 20-30% more concrete. "Conversely, too shallow or small a foundation can lead to failure or may necessitate a rebuild if inspectors deem the foundation inadequate. This is particularly important in high volume or large scale developments where labour that would previously be employed for several days just digging foundations, may now be redeployed to more skilled positions such as brick and mortar preparation and building, or even as an operator of the Ditch Witch. "On smaller construction sites, it is still possible to use a Ditch Witch and contractors should plan carefully to find a hire company that has a Ditch Witch in stock and hire it for the foundation work. Machine hire for one day is far cheaper than paying wages. In addition, the workers can rather be put to work in the actual construction of the house albeit “fetch-and-carry” or preparation work as understudies to builders,” says Keith. Phillip Mc Callum, ELB Equipment product manager agrees, adding that in the course of modernising the building site, the Ditch Witch RT-45 has far wider applications where it can equally revolutionise the way work is currently being carried out on applications such as laying of water, electric, fibre optics and gas utilities. These can also be done more quickly and accurately with a Ditch Witch. “At this moment, there is massive call for trenches to be dug to lay fibre optics and with the addition of a Ditch Witch, contractors can lay more meters per day with a single machine, with less mess than an entire crew of 30 hardworking men can do in a day’s work. In addition, it can even be set to cut narrow trenches (about half the width of a spade) which minimises disruption of sidewalks and pathways etc. If the need arises the Ditch Witch selection includes a range of different machines for a wide range trenching requirements including small pedestrian trenches from 16-30hp, as well as ride on / heavy duty trenches from 40-120hp,” says Phillip. A new micro trenching system available from ELB Equipment allows utilities to be laid below the road surface with only minimal disruption of the road surface. 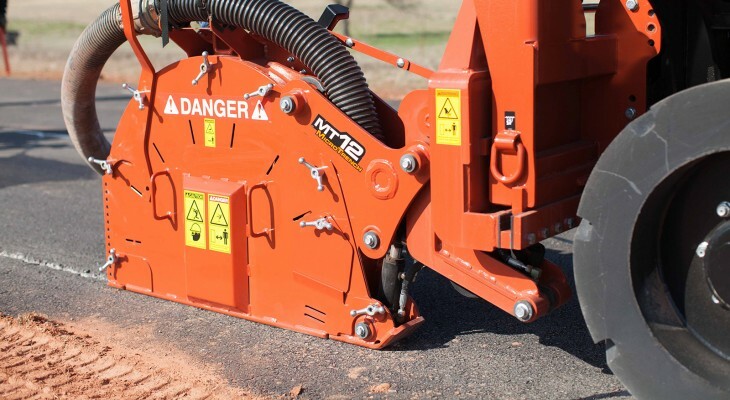 The Ditch Witch MT12 MicroTrencher is a fast and precise attachment system which is designed to reduce damage to the road and avoid lengthy traffic disruptions. It’s specially designed saw blades are designed to quickly and precisely cut asphalt surfaces to a preset depth to allow fibre and other utilities to be laid above existing utilities. The cleanness of the cut and ability to cut narrow trenches enables the contractors to rapidly repair the surface and reopen roads in a fraction of the usual time. With variable depth settings and the ability to maintain exact levels the new system prevents uneven installations that may reduce the efficiency of utilities being laid. In addition to crossing roads the MT12 can also be used to trench 610mm transversely in order to be able to trench parallel to kerbs and gutters.